I just want to say first that you have an amazing website with a treasure trove of information. The best I have come across yet. Currently I have 10 of these beauties (3 males, 7 females) in a 40 gallon breeder tank, planted. But reading through your section on STT's I didn't find any information on breeding. I have read some things on other websites (a separate tank with subdued lighting, conditioning with live or frozen foods, slightly elevated temperatures (low to mid 80's), and slightly acidic ph) and I was wondering if my 10gal tank with a sponge filter would be good for a spawning tank. I know they eat eggs, but could I use one tank to spawn multiple pairs? Any information would be super helpful. <Distilled water and RO water are interchangeable for aquaristic purposes; indeed, rainwater has historically been used as a substitute for both, though there are attendant risks to using rainwater to do with ambient air pollution and the cleanliness (or otherwise!) of roofs, gutters and rainwater storage butts. And yes, it's absolutely standard practise to mix tap water with de-mineralised water to make up what you want; for example, I routinely use a 50/50 mix of rainwater and tap water for my water changes, but the exact proportion will depend upon the desired hardness (pH is somewhat less of an issue provided its stable, as it seems to be calcium ions in particular that affects the viability of fish eggs). So if you have 20 degree dH hardness water and want water of 5 degrees dH, then you'd use 25% tap water and 75% de-mineralised water of some sort. Assuming you don't have clean rainwater, then the easiest way to get (relatively) inexpensive de-mineralised water is from your local aquarium shop, where it'll be sold by the gallon for use in marine aquaria. Do bear in mind you'll need to scale your demands for such water with regard to both the aquarium size and the frequency of water changes, so budget accordingly. In any case, I've not bred Emperor Tetras so can't comment in detail, but it is generally regarded as one of the easier tetras to breed, so definitely worth a shot. <No personal experience of this species but Baensch suggests using pairs. The breeding tank is dark 75 F and I may get a male emperor tomorrow to even it out. These tetras can be $7 each unlike the $1 sales on neons. It's strange they are so pricy here. 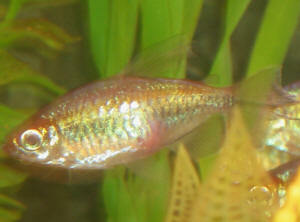 Good afternoon Neale, just thought I would send you some pictures of those beautiful Diamond Tetra's in their 125 gal. They are growing up and I believe they are spectacular with their long flowing fins and sparkle.